Sustainable agriculture is a way of growing or raising food, including animals, in an ecologically and ethically responsible manner using practices that protect the environment, safeguard human health, are humane to farm animals and provide fair treatment to workers. Eating sustainably provides numerous personal health benefits, including decreased exposure to harmful substances such as pesticides, antibiotic-resistant bacteria and unhealthful food additives. 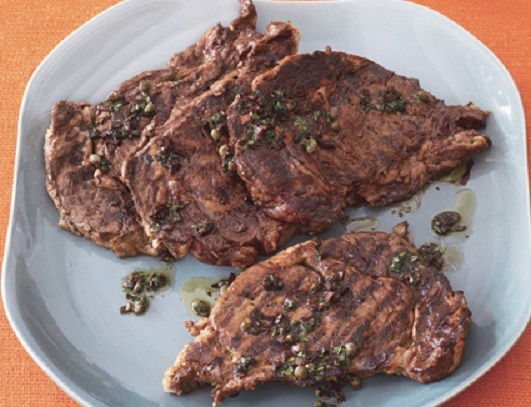 It only takes a little extra care to grill tender and delicious grass-fed meat. But why buy grass-fed meat when most supermarket aisles are full of cheaper cuts of grain-fed meat? The reason – grass-fed meat is generally healthier for you. It is lower in overall fat and saturated fat and it provides a higher amount of heart-healthy omega-3 fatty acids than grain-fed meat. Meat from grain-fed animals typically contains only 15% to 50% of the omega-3 of grass-fed livestock. Meat from pastured cattle has up to four times as much Vitamin E as meat from feedlots and is much higher in Conjugated Linoleic Acid (CLA), a nutrient associated with lowering cancer risk. There is also less risk of E. Coli bacteria or mad cow disease in sustainably raised meat. Grass-fed meat is also generally lower in calories: six ounces of steak from a grass-fed cow may have 100 fewer calories than steak from a grain-fed cow. When grilling grass-fed meat, be careful not to overcook it. 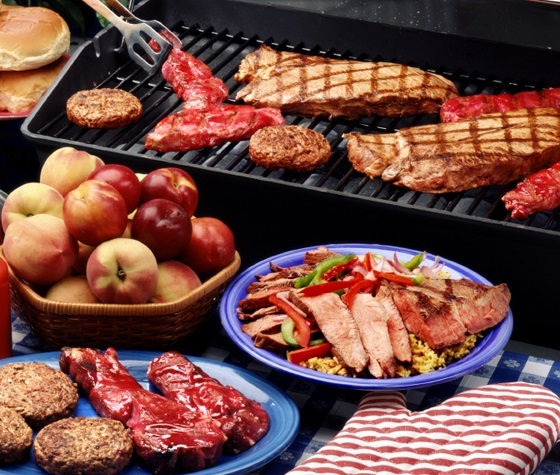 Grass-fed meat requires less time to grill than grain-fed meat. Since it is generally leaner, with less fat to keep it moist, it will cook faster at the same level of heat. Grass-fed meat is best cooked medium rare to medium, or it will become tough. Check the internal temperature with a meat thermometer in the thickest part. At 135°F the meat is still rare. At 145°F to 155°F it will be medium. Above that the meat may lose its moisture and tenderness. Let the meat rest for a few minutes after cooking it to help redistribute the juices inside. Do not cut it immediately since the juices will spill out, leaving a drier texture. For the same reason, turn meat with a spatula or tongs rather than a fork. Grass-fed beef makes an excellent burger, often ground from many different cuts of the cow. An ideal patty is 6 ounces of raw, grass-fed ground beef, formed into a 4 1⁄2 inch wide circle, 3⁄4 inches thick on the edges and 1⁄2 inch thick in the center. Form the burger, then gently press the center on one side to create a small depression so that the patties will cook evenly and not become puffy and round. If you like, add salt and freshly ground black pepper. For a crusty exterior and a juicy interior, grill burgers over medium-high heat. Six-ounce burgers do not require much cooking time. Two and a half minutes on one side and then three minutes after turning will yield a medium burger. Don’t press burgers with a spatula or you’ll squeeze out the juices. Today, 80 percent of the world’s marine populations are fully fished, over-exploited, depleted or recovering from depletion. With seafood growing in demand, it’s critical that sustainable fishing practices are followed, if wild-caught seafood is going to continue to be available in the future and if farmed seafood is going to be able to supplement wild fish supplies. It is a good idea to know where your seafood comes from before purchasing. Fish can be grilled whole or in fillets. Avoid very delicate flaky fish, like sole, because it may fall apart. Shellfish, like shrimp, can be skewered and then placed on the grill. You may not want to know how hot dogs and sausages are made. Mass-produced hot dogs may contain MSG, nitrates and odd animal byproducts. But healthier hot dogs and sausages made with pastured/grass fed beef and pork and vegetarian dogs, are also available for you to grill. Hot dogs are generally pre-cooked, but sausages often start out raw, so be sure to cook them over lower heat to ensure that they are cooked through. Free-range chicken requires the same grilling techniques as factory-farmed chicken, but with tastier results. Heritage breeds, such as Berkshire pork, are bred for qualities that have been bred out of many factory-farmed pigs. Berkshire pork is juicy, flavorful, tender and well marbled. Its high fat content makes it suitable for long grilling at high temperatures. Factory-farmed pigs are generally leaner, so they can be dry and have little taste, often requiring brining and artificial flavoring. Buy locally grown fruits and vegetables when they are in season. 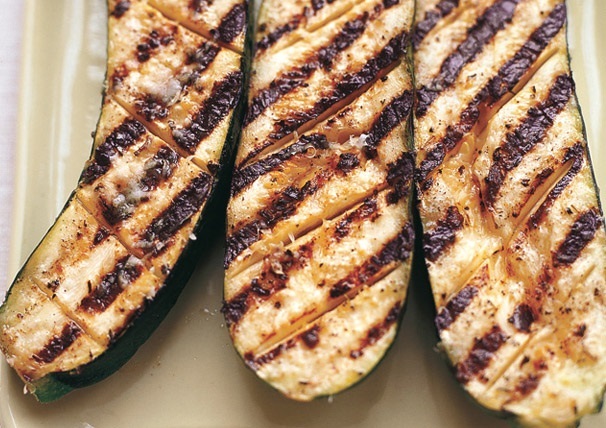 From asparagus to zucchini, grilling vegetables is also popular. Produce picked fresh before you grill it may need less seasoning or sauce. Just brush with oil, sprinkle with salt and pepper and grill. Corn on the cob cooks well on the grill. Pull the silks from the ear and brush with oil and add herbs and spices underneath the husk, directly on the cob. Cover the corn with the husks. Cook for about 10 minutes, turning occasionally. Green and red bell peppers can be grilled easily and successfully. Cut and seed them first. For vegetable kebabs, soak wooden or bamboo skewers for at least half an hour, so that they won’t catch on fire or use metal skewers. Portobello mushrooms can make a great vegetable burger. Clean the caps, brush them with oil and put them on a hot grill gill side down. When the mushrooms have softened (5 – 8 minutes), turn them and cook for a minute or two longer. Fruits such as apricots, peaches and pineapples are also delicious grilled over low heat. Natural sugars will caramelize the fruit where the grill touches them. Softer fruits and vegetables may need to be grilled on foil packets. Here is a menu based entirely on sustainable foods – give it a try. 4 appetizer servings. If you would like to make this recipe as a main course, grill 16 scallops and serve four per person. There is enough dressing for 16 scallops. Warm the 1/4 cup of oil in the same saucepan. Add the ground spices along with the lemon juice and let stand for 1 minute. Add the tomatoes, chopped fennel, oregano and shredded basil; season with salt and pepper. Set aside. Brush the scallops with oil and season with salt and pepper. Grill the scallops over high heat, turning once, until browned and just firm, about 4 minutes. 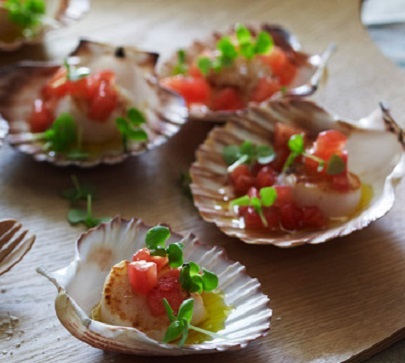 Place two scallops in individual serving plates and spoon a little of the warm tomato dressing on top. Garnish with additional fresh basil leaves and serve with Italian bread. Simmer vinegar in small pan over medium heat until reduced to 1/4 cup, about 6 minutes. Add shallots, 1/4 cup olive oil and crushed red pepper; return to a simmer. Remove from heat; whisk in parsley, capers and thyme. Season vinaigrette with salt and pepper. Rub both sides of the steaks with oil and garlic. Mix smoked paprika, 2 teaspoons coarse salt and 1 1/2 teaspoons black pepper in small bowl. Sprinkle on both sides of the steaks. Let stand at least 15 minutes and up to 1 hour. Prepare barbecue (medium-high heat). Brush grill rack with oil to coat. Grill steaks until cooked to your desired temperature, about 3 minutes per side for medium-rare. Transfer steaks to plates and spoon vinaigrette over. Combine vegetables and seasonings in a mixing bowl. Divide among four pieces of heavy-duty foil (12 inch squares). Dot each with 1 tablespoon of cubed butter. 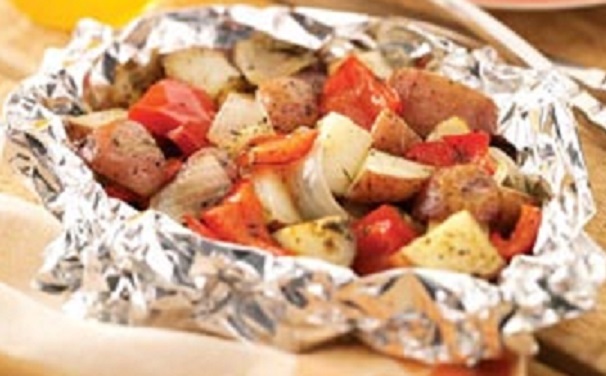 Fold foil around vegetables and seal tightly. Grill, covered, over medium heat for 15 minutes on each side. Open foil carefully to allow steam to escape. Score cut side of zucchini halves diagonally about 1/4 inch deep at 1-inch intervals. Melt butter with lemon juice, lemon-pepper seasoning, garlic powder, oregano, and cayenne powder in a heavy small saucepan. Season with salt and pepper. Brush seasoned butter on the cut sides of the zucchini. Place zucchini on the grill and cook until grill marks appear on all sides and the flesh is just beginning to soften, about 12 minutes. Turn zucchini, cut side up, and sprinkle with cheese; close grill lid and cook until cheese just softens, about 1 minute. Transfer zucchini to a platter. Brush nectarines with butter and grill, cut side down, until grill marks appear, 4 to 5 minutes. Turn nectarines over. Fill pit holes with cheese, then sprinkle with pepper. Grill until grill marks appear on bottoms, 4 to 5 minutes. 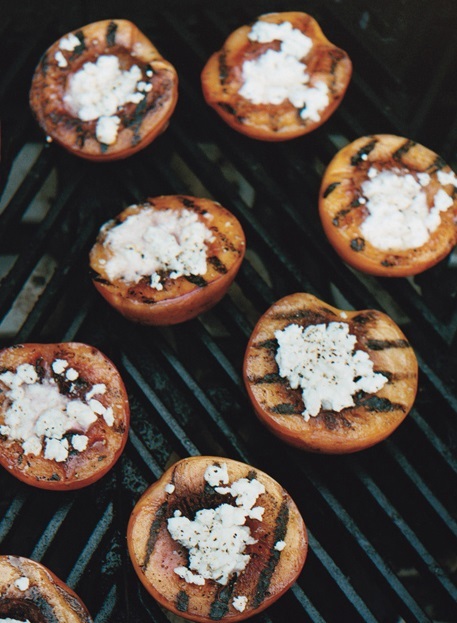 Mmm, grilled nectarines with feta – now there’s a fine idea! Quite tasty – warm fruit and the cheese. Thanks Annie. Yes I know and I am grateful you are. Well written article Jovina. I love the Scallops with Tomato-Basil Dressing and the Grilled Nectarines with Feta. I found a recipe grilling peaches with basil. I always use goat cheese in place of feta. I fell in love with the flavorfirst time I ate it, and use it ever since. I also like Asiago cheese. Thank you so much. The scallops are delicious and I often make this recipe for us as a dinner entree. Grilling any stone fruit is really tasty. I am not a fan of goat cheese, so you will usually see feta, along with the Italian cheeses, in my recipes. It is certainly easy to swap out my feta for goat cheese, if you like it. Grilling is one of my favorite things about summer! Those scallops look amazing. Thanks Mary. It is really something different to do with scallops. Very good tips and a very good cause. I read Eating Animals a few years ago and though I’m not a vegetarian, the industry seriously made me want to stop eating meat. I agree and for a long time now, we only eat meat that comes from an organic farm and seafood that is sustainable. Most of the vegetables we eat are organic and come from local farms. We need to think more about the food on our table. Many good tips in this post, I love the recipe too, it is really drooling good! Thank you so much, Treedson. I agree. We really don’t eat meat too often but when we do we only buy organic, humanely raised meat. This is a really good post Jovina. Grilled nectarines sound wonderful! Thank you and so happy to read your comments.